Hotel Noble Inn is a family managed hotel. It was established in 1960 after Nepal opened up for outside tourists. Today, Hotel Noble Inn is a modern hotel with all the modern services for their guests. They are not just a commercial hotel, their greatest concern is their guests. 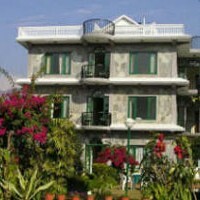 Hotel Noble Inn is known for its great service, friendly surroundings and hospitality. They have a beautiful green garden. From their rooftop, you have a great view of the Mt. Annapurna range and the Phawa Lake. Hotel Noble Inn is situated in the central part of the Lakeside, only a 100 meters away from the main road, which make their guests safe from the main road’s noise and dust. They have a their own café and restaurant in the hotel. You can enjoy in their garden café , rooftop café or indoors café. Except their café and restaurant, other good restaurants are lies in the main road, which are just a 100 meters away from the hotel. They recommend some of the nice and good restaurants for their guests. They serve really good food for relevant price.